Saturday, Feb. 21, 2015, 2-4 p.m.
Born in Cairo, Illinois in 1891, Lewis was the son of two educators who escaped from slavery. In 1915, he earned his PhD in physiology and pathology from the University of Chicago, and in 1917, in his final year of medical school, completing his clinical instruction at Rush University, Dr. Lewis was inducted into Alpha Omega Alpha and served as his Chapter’s president. Later that year, he became the first African American to teach at the University of Chicago, where he was a noted expert in immunology. In 1926, Lewis was among the first to receive a Guggenheim Fellowship Award for study abroad and conducted research at the University of Basel, Switzerland. He continued his career as a research scientist and physician at Provident Hospital in Chicago, working until he died at the age of 98. Dr. Lewis was a man of many firsts. He was the first African American inducted into Sigma Xi (1913), Phi Beta Kappa and Alpha Omega Alpha (1917). 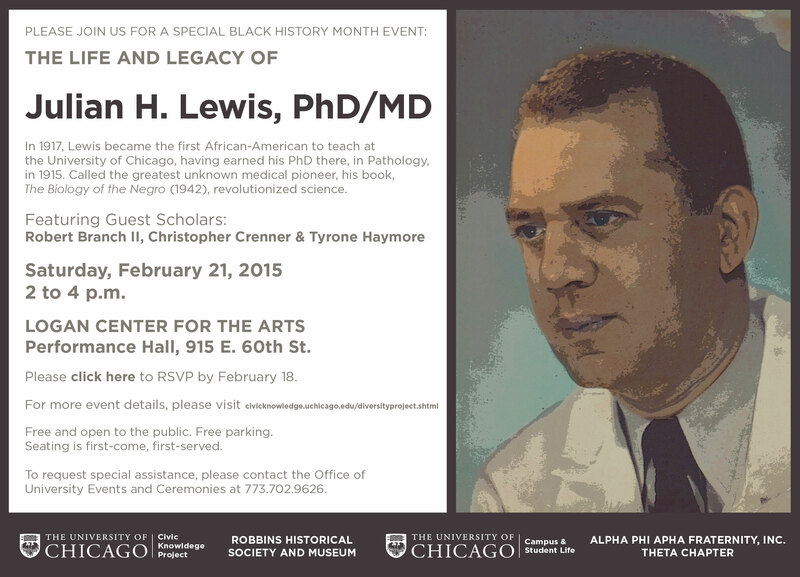 He was the first African American in the world to hold both an MD and a PhD and the first to join the University of Chicago as a faculty member. He also later worked for the U.S. military as a researcher and worked to aid the people of Ethiopia. A highlight of the event will be the unveiling of a specially-commissioned oil painting of Lewis, which will be donated to the Smithsonian’s National Museum of African American History and Culture, scheduled to open in Washington, D.C. in 2016. Representatives from the Smithsonian will be present for the unveiling. Updated on September 28, 2017.